Photographed at Iten, Kenya. 11 January 2012. The colors presented by the plumage of glossy starlings is produced by minute structural elements in the feathers that refract incident light. Thus, depending on the orientation of the observer relative to the sun, the colors will vary considerably. The most brilliant colors are produced when the sun is behind the observer. The darker blue patch behind the eye may not be apparent from all angles. 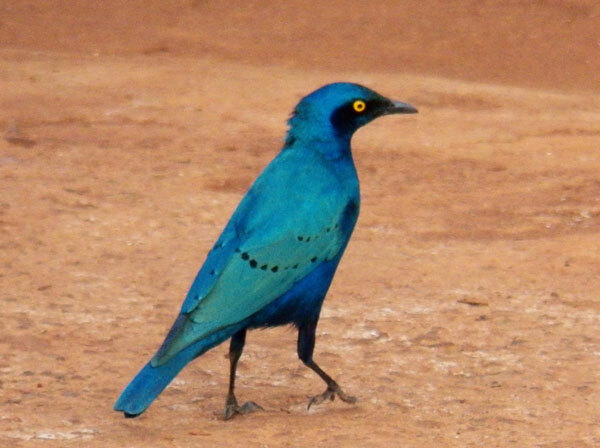 Greater Blue-eared Starlings flock in groups and may forage around and near wildlife or domestic cattle. Their principal food is insects.